Douglas Carswell should call a by-election after announcing he is leaving UKIP to sit as an independent MP, ex-party leader Nigel Farage has said. He said he had campaigned to allow constituents to recall MPs and trigger by-elections, and must be held to that. "He has now given up the label on which he was voted in," Mr Farage added. Mr Carswell, who called a by-election when he defected to UKIP from the Tories in 2014, said one was not needed now as he was not switching parties. The MP told BBC One's Sunday Politics: "I'm not submitting myself to the authority, to the whip of a new party. If I was doing so then quite rightly, as I did previously, I would feel obliged to trigger a by-election." Mr Carswell said he had emailed nearly 20,000 constituents on Saturday and had "a huge number of responses back", adding: "All but a handful were overwhelmingly supportive." Asked if he would run in 2020 - the current most likely date for a general election - as a Conservative MP, he said he felt "pretty comfortable with being independent" but added: "Let's wait and see." Referring to MEP Mr Farage's previous unsuccessful efforts to get elected to the Westminster Parliament, Mr Carswell added: "You know, there have been several by-elections where Nigel's had the opportunity to contact the electorate and those didn't always go according to plan." The two men have had a tumultuous relationship - Mr Farage has accused Mr Carswell of working for the Conservatives and has said in the past he wanted to "get rid" of him. Mr Farage, who resigned as party leader after last year's EU referendum result, told the BBC: "He was voted in as a UKIP candidate, and whilst he had a personal vote, it's a constituency in which UKIP is very, very strong. "I could be wrong, but I suspect there will be a lot of very angry UKIP voters in Clacton." He pointed to Mr Carswell's backing for recall powers to give constituents the power to call a by-election, if 20% of the electorate backed one. "What we will do is we will take him at his word and we will now write to every house in Clacton and ask them: Do you want a by-election or not? And if more than 20% say that they do, we will then find out just how honourable Mr Carswell is." He said he believed it was a "very good unifying day for the party" - blaming splits with Mr Carswell and his supporters for many of the stories of internal division that have hit UKIP. 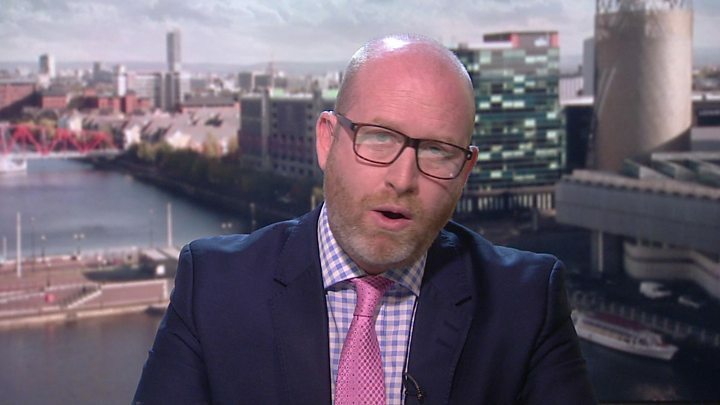 His successor as leader, Paul Nuttall, told the BBC he was "disappointed" Mr Carswell was leaving "because I wanted Douglas to be part of the post-Brexit UKIP where we could move forward with a raft of domestic policies". Mr Nuttall said the party was "not a single issue pressure group" and would now "move on to a new exciting era". He also confirmed that businessman Arron Banks - UKIP's largest donor - was "not a member of UKIP at this present moment", amid reports that Mr Banks' membership had been suspended and he was demanding £200,000 be repaid. 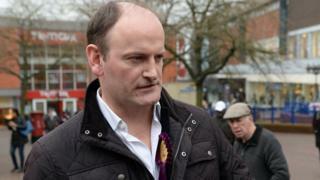 Mr Carswell, 45, first entered the Commons in 2005 as MP for Harwich, defeating Labour's candidate by just 920 votes. By 2010 he defeated the same opponent by 12,000 votes - although boundary changes had seen the seat renamed. After defecting to UKIP he stood down to seek re-election in a by-election, which he won by 12,404 votes in October 2014. At the general election in 2015, he retained the seat with a 3,437 majority. Brexit: What would 'no deal' look like?